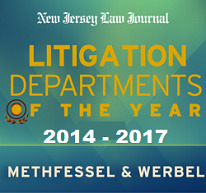 Nabila Saeed joined Methfessel & Werbel in April 2014 after working as an associate for the law firm of Stark & Stark, where she handled commercial litigation matters. Upon graduating with honors from Rutgers School of Law, Camden, Ms. Saeed completed a judicial clerkship with the Honorable Sheldon Franklin, a family law judge in Ocean County. Ms. Saeed was responsible for reviewing motions and making recommendations to the judge regarding final disposition. She conducted research and drafted legal memoranda on matters involving distribution of marital property, child custody and support. Ms Saeed also served as a court-trained mediator, assisting parties in the settlement of Special Civil Part cases. During law school, Ms. Saeed served as a Lead Editor of the New Developments Section on the Rutgers Journal of Law & Religion, and her article about prisoners’ right to preach under the RLUIPA in New Jersey was published in the Summer 2010 edition, at 11 Rutgers J.L & Religion 541, 541-57 (2010). Ms Saeed was a summer intern at the Staff Attorney’s Office at the United States Court of Appeals for the Third Circuit during the summer of 2010. In addition, she served as an extern for the Honorable Faith Angell in the United States District Court, Eastern District of Pennsylvania. As a member of the Domestic Violence Clinic, Ms Saeed also handled several bench trials on behalf of clients seeking a final restraining order in Camden County Superior Court. Ms Saeed is a member of the Liability Defense team, working under the direction of William Bloom.